A quick round-up of some of the recent electronic releases and news. First up, props to the people at Lost in Musik for an interesting and clear minded analysis of the economics of producing and releasing electronic music. There are many important revelations in the article, not all of them surprising. The obvious one is that nobody is making money in these days of piracy and downloads. The other being that releases are essentially meaningless agglomerations of songs as most people are buying music by the individual track. This is kind of funny and sad as it represents a conceptual chasm between more traditional music fans and the younger generation and is essentially an indictment on the immediate and over supplied market of modern music. That is to say, that what was once the next level of the musical creative process, binding a collection of tracks together by theme, flow, artwork, mood etc into an album or ep now seems an antiquated and pointless gesture as it will now be less and less appreciated as a whole and reduced to the “essential” elements. Part 2 of the essay is due to go up on their site as this is posted, but there are still a few questions remaining. Firstly, there is a slow gathering of momentum in dance music to give the right to download MP3 versions of the tracks when you purchase a vinyl album or single. Some labels doing this at the moment are Kompakt (at least with albums), Kontra Musik and Delsin (see below), to name a few. How is this effecting vinyl sales? When will we see more of this as it is frustrating having a nice record sitting at home, but being unable to put it on your mobile device without paying for it again or making an illegal download. Another side of this is why some albums come out with such a greatly reduced number of tracks on the vinyl format than the CD/digital release? Is this really for improved audio quality as often stated or is it to promote sales of the remaining tracks by download? A few examples of this might be the Kontext album “Dissociate” on Immerse, Martyn’s “Great Lengths” (see also below) and Conforce’s “Machine Conspiracy” on Meanwhile, to name but three. Here the example is Conforce “Stop hold”, present on the CD, but absent from the vinyl. Secondly, in all genres and not just electronic music, there has been another slow evolution where both vinyl and CD releases are being remarked as box sets or luxury products to increase desire for ownership. 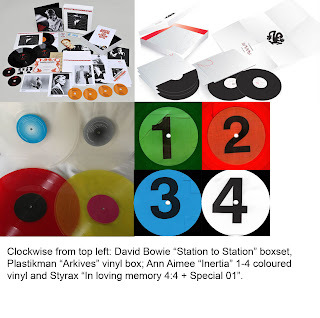 Some examples of this might be the recent Plastikman or David Bowie “Station to Station” box sets, the recent 4 vinyl sets on Styrax and Ann Aimee (see pictures and below), and the luxury versions of singles by Theo Parrish, Tensnake or Burial with Massive Attack, usually by the Vinyl Factory. This brings us to another issue of availability: such low runs of highly desirable products means only the nimble will make the purchase and the rest will be left with their MP3s, legal or otherwise. Anyone who ever received mail order catalogues like Boomkat will know what I mean. If you don’t get straight in to get what you want, you find everything sold out, often within hours. Just look at the chaos surrounding the release of the Sandwell District album back in January as one example and check the current price on Discogs. Given the trend for buying individual tracks, it raises the question as to which track you would go for on an album or single if you could only have one? In the case of Martyn’s new album “Ghost people” on Flying Lotus’s Brainfeeder label, the answer is a no brainer. The only track you need here is the last one “We are you in the future”. This is not to say the rest of the album is a turkey, far from it, but there is so much drive and vitality on this track that it stands apart from what comes before. However, Fact mag while also singling out this track and praising it as “the most composed, well-produced record of his career” they also claimed the lack of surprises sunk the ship despite all the quality production. While I agree completely with the reviewers assessment, I would put a positive spin to the lack of surprises. It is true that “Ghost People” is kind of mindless in a way, but I actually enjoy that side of Martyn’s music as a positive: great well-made tracks that just work and no nonsense. “Great Lengths” for me was something of a disappointment, partly given that the vinyl version stripped away so many tracks and broke the flow (see comments above), but partly because the full length recycled a few tracks and almost added too many. Which was the real album in the end? So while it did signpost a big genre swing, for me the swing was already underway and the album, as good as it was, was too overblown and undefined to catalyse another step forward. In a certain way I find both Hotflush and Scuba approaching a sound reminiscent of Martyn, but at the same time on another level. There is a certain plastic sound to the production, where the sounds seem smooth and fluidly moulded and colourful in matt or brilliant sheens. But where Martyn keeps it simple, Hotflush and Scuba seem to complicate it by mixing the pleasure principles and chemical production values of labels like Innervisions with the avante garde leanings of labels like Hyperdub and the deeply rooted urban spirit of post-Burial electronica. A kind of plastic dub if you like. Curiously, one of the B-sides to the “Adrenalin” single, “Everywhere” resembles the Luomo track “Could be like this” from the 2003 “Present Lover” album. On the eve of the release of Luomo’s new album “Plus” on Moodmusic, this example perhaps goes to show where Luomo might have ended up following different trends and instincts. In several interviews over the years, Sasu Ripatti has claimed to be tormented or frustrated by the press harking back to his landmark debut “Vocalcity”. Since then, Ripatti has embarked on a long odyssey to avoid repeating himself as if to undermine the press. But having arrived at “Plus” I am left with the thought that Ripatti’s anxiety on this issue has cost him dearly. So much of “Plus” sounds forced, clumsy even. It is not so much the technique that is gone (Ripatti has always impressed under his Vladislav Delay moniker and parts of “Plus” really shine brightly), but rather it is perhaps the spirit that is lacking. House music is essentially soul music and the presence or absence of such sentiments is essential for success or failure. In addition to some average vocals Ripatti also makes life difficult for himself on “Plus” by trying to marry the smoothness of house with the fragmented angles of electro and the results do not always pay off. But back to Hotflush and the one track idea: only a brave man would go for one or the other of the two vinyl (and additional digital) tracks on the new Paul Woolford and Psycatron 12” “Stolen”. Absolutely mind-blowing. If having to choose I would go for the first dub mix as it contains one of the best synth hooks I have heard all year. The build ups are feisty and the heavy weight drum programming adds an inescapable momentum. Here the first (vinyl) dub mix is presented in edited form as part of a recent Fact mix by Woolford. Finally, the Hotflush duo Sepalcure of Travis Stewart (Machinedrum) and Pravin Sharma (Braille) are set to release their debut album in November. The album is a mesmerising blend of Hotflush’s plastic dub sound, the more grounded breakbeat styles and warm synth washes of earlier Hotflush releases like Joy Orbison and Mount Kimbie and the complicated, paranoid collage elements of the new Flying Lotus school of sound. Finally to Holland where there is plenty cooking inside the Dutch oven. Delsin sister label Ann Aimee has released the first two of four limited colour 12”s in the Inertia series (pictured above). The music is forceful and distinguished with the line-up of the 16 artists drawn from the local pool of Dutch producers and several international guests. Local DJ and producer Niels Luinenburg aka Delta Funktionen has also reassembled the set into the labels first commercial mix CD called “Inertia: Resisting Routine”. The mix will not be released until December, but in an intriguing move, buying the CD will also give access to the individual tracks. Also from Amsterdam will come the Rush Hour “Amsterdam Allstars” compilation which will sample the current (high) state of the art of the Dutch capital. A taster 12” has just come out with one exclusive track by Young Marco not to be included in the upcoming 2 volume set of double vinyl! A slightly different business model then to Delsin/Ann Aimee. The other sampler track is by Amsterdam-based, but not Dutch born producers Juju and Jordash. This will appear on the albums, returning to the question of whether this needs a vinyl release at all for what is essentially one track.